After mentioning glycolic treatments and chemical exfoliators recently, a couple of readers emailed to ask if I have any experience with Alpha H Liquid Gold, which is somewhat of a cult product. As a matter of fact I do. I bought Alpha H Liquid Gold (and Alpha H Vitamin C serum) a couple of years ago when it was still available from ShopNBC. A little rummaging unearthed the still half full bottle. You can tell that it didn't knock my socks off. Alpha H Liquid Gold is a liquid toner you smear on your thoroughly cleansed face and leave it to do its magic for any length of time between 10 minutes and overnight. The active ingredient is glycolic acid, a form of AHA. You're supposed to use Liquid Gold every other night, since it's quite potent. How strong? That's my problem with this product. Alpha H doesn't disclose the liquid's concentration which annoys me greatly. I didn't see much of an effect during the weeks I applied Liquid Gold religiously (other than over dried skin), which I attributed to the fact that I'm already a Retinol user, but who knows? 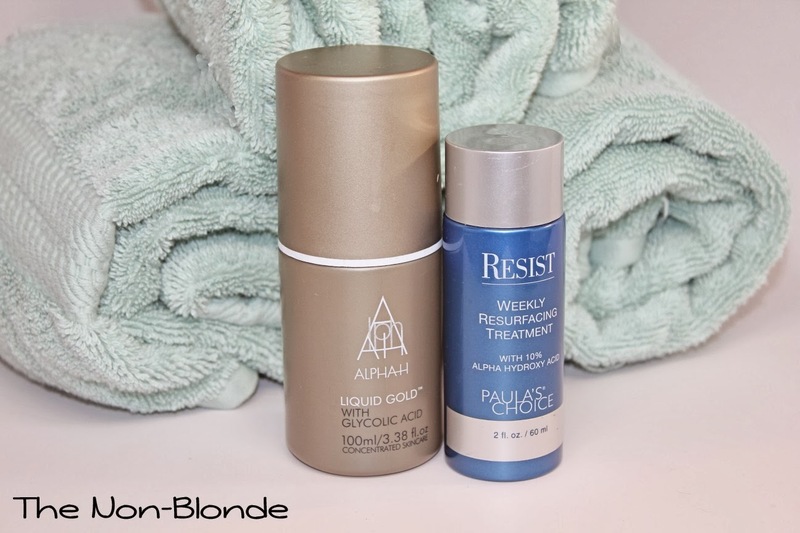 In any case, I didn't find this product to be as phenomenal as I hoped it would be, and since it's a bit hard to find these days I wasn't going to go out of my way to immerse myself in Alpha H products (currently it's sold online on Beauty Bay, a retailer I don't trust, and directly from http://alpha-h.com, $61.50, 3.4oz). If you're using a prescription retinoid product (i.e. Renova) apply the exfoliant first and allow it to set, then apply the retinoid product. Follow with a serum and/or moisturizer. So while you're not supposed to combine exfoliants on the same night, if you use a prescription one you can still apply it after the AHA treatment. As for results, I can see an improved texture when I use RESIST overnight. Ten minutes is too little for me, but several hours bring on renewed radiance and a smoother surface. This product is a winner for me ($30, 2oz, paulaschoice.com). Why don't you trust Beautybay? Yeah, I'm also bummed about the % non-disclosure - although I've never emailed the company to find out. I have the liquid gold and use it about once a week. Every other day is too much exfoliation IMHO! Personally, I don't find the results any different to any other concentrated glycolic exfoliants (in liquid or pad form). I've been trying to find the difference between these two glycolic products. It *is* frustrating Alpha-H doesn't list the concentrations. I have tried only the PC version, which has another two pros going for it: no denatured alcohol and far less expensive. Has your opinion on the two changed since this post? Have you found a glycolic that supersedes the aforementioned products?